I'M THANKFUL FOR PODCAST 123! Hey guys! 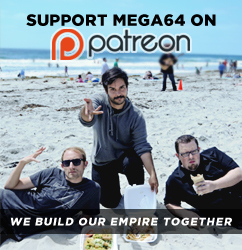 The Mega64 crew gives thanks, in our second annual Thankscast! We talk about Boston Market, Teeth, and of course NEW MOON!! Make sure to check this one out. You'll be THANKful you did! Click here for the audio version. Have a Happy Thanksgiving! Come back for some Black Friday dealz! We also got hoodies back!